I was born with a special gift. Someone put a stone into my cradle. It looked normal at first sight, but it is not ordinary at all. It is able to find power in all basic elements of our world. When I breath in damp smell of earth, I feel death and life as they are intertwined. In the air, I feel powers of effervescence. And when I want to and I think of it, I can use these elements to bring omnipotent beings to life. Long forgotten and never before seen monsters. But I found I am not the only one with these capabilities. There is only few opportunities for real fights in our life. And we enjoy every battle. Thus whenever two summoners meet, there is always a battle. 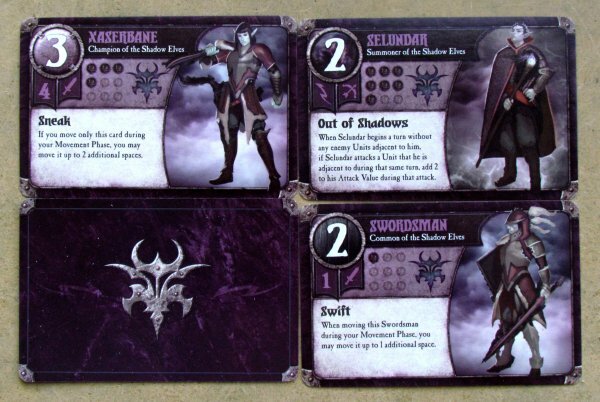 Summoner Wars is the name, we started to call it. 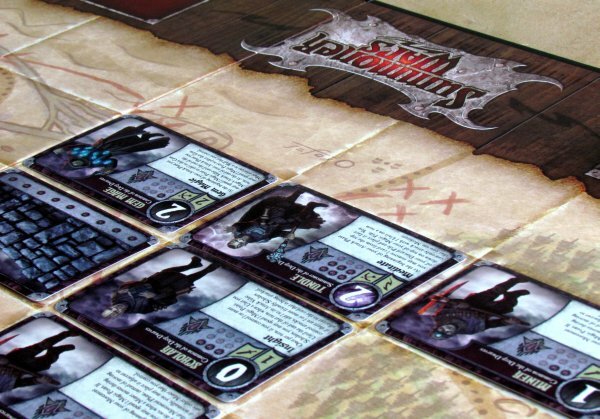 Summoner Wars are but above all board game coming from Plaid Hat Games, which was their first published game. Now, thanks to its success, we have had chance to play such remarkable games such as Mice and Mystics (review) or Bioshock Infinite: Siege of Columbia (review). And that’s why we decided, its time to see, how its played and why it has so many fans all around the world. Its history began to write in year 2011, its author is Colby Dauchy, while the illustrations were done by John Ariosa and Gary Simpson. 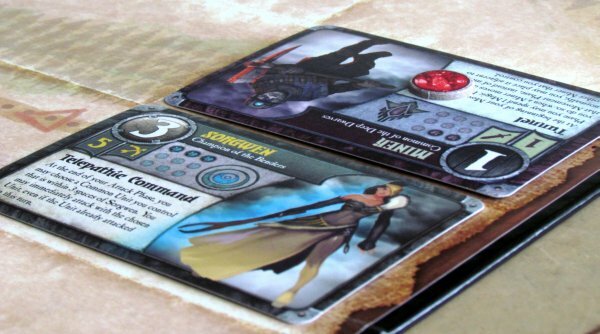 We have reviewed box called Summoner Wars: Master Set, which is sort of deluxe version of the basic game. 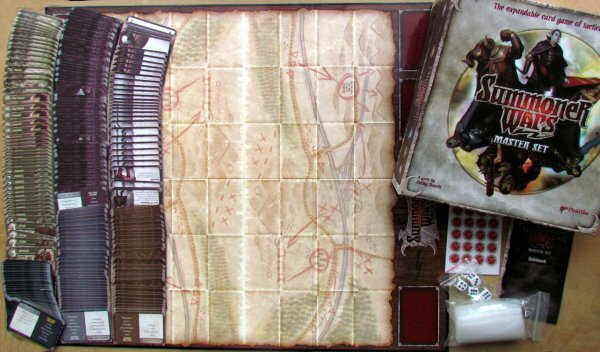 Entire game is hidden in a large square box, which is dominated a big glossy game board. It is comprised of variety of fields, that exactly match the dimensions of the cards. 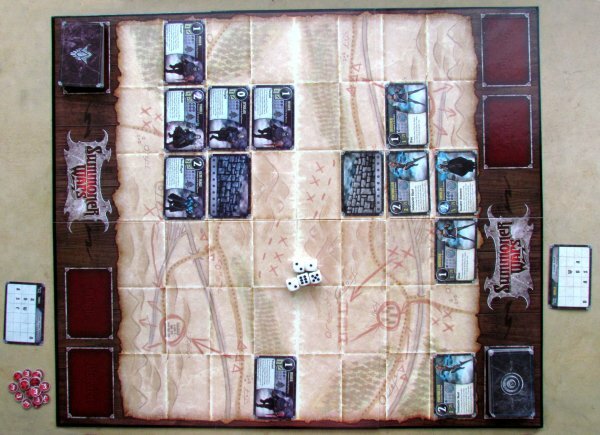 Whole battlefield is divided into half with a light line, giving each player his playing field with an area measuring six by four card spaces. Board is painted with a variety of tactical advice, but units have to start somewhere first. Therefore, each side of the board has place for three piles for both participants in the battle. But this game revolves around something completely different – cards. There is 225 of them inside the box and they represent walls, events, but also units from six different races. Cards are oriented horizontally and you can easily see largest number in the upper left corner, which announces to every player unit’s attack power. Just below are hanging two banners indicating summoning cost and also a way of fighting (ranged or closed). 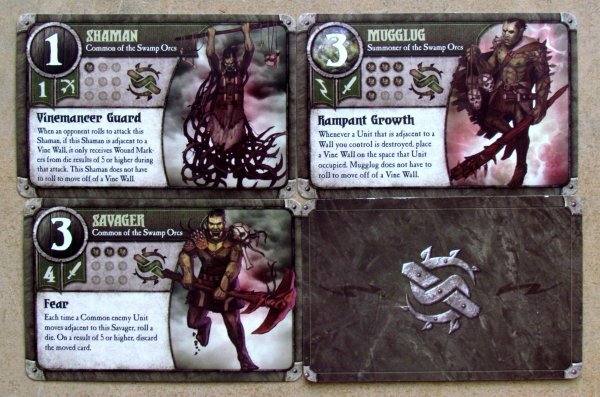 In area below, there are printed special powers of each unit. Every soldier is wearing also box with small dots representing number of lives. 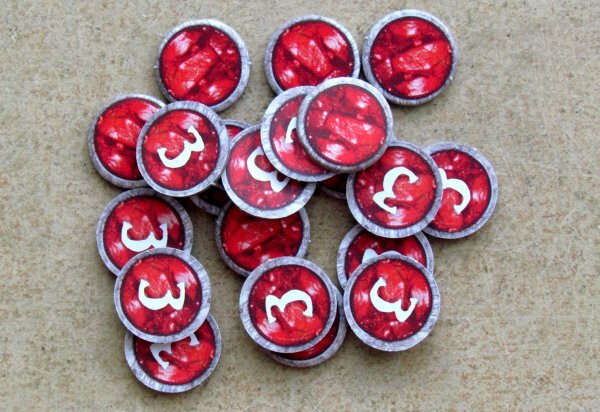 We’ll have also five dice and a sheet of twenty wound tokens inside the box. 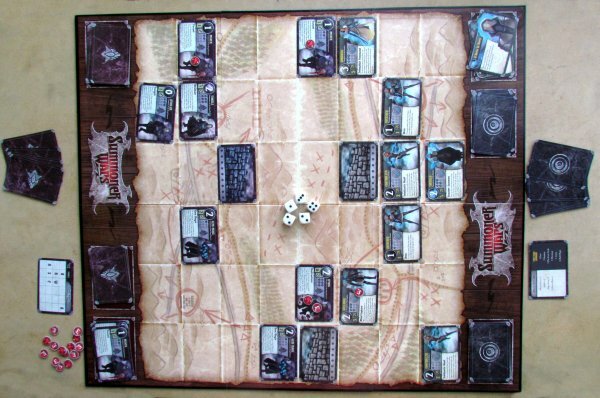 At the beginning of the game, players spread battlefield board between them. Each player takes a deck of color-coded cards and finds his starting card. Initial setup for a given faction is described there. Remaining cards of such race are shuffled and placed on the designated space on the board for drawing pile. Players get no cards for beginning of the match. Starting player has some limitations to his first turn and can do only some parts of the turn, so he does not have too great an advantage. 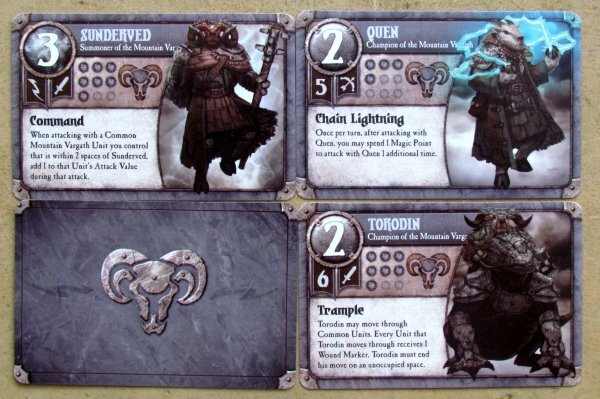 Only then may both players gradually pass through all six phases, that are available in match of Summoner Wars. It all starts by drawing cards from the deck up to five. A player’s deck will never be replaced by anything else, and once it runs out, he must complete a duel with summoned forces (and cards in hand). Once a player has five cards in hand, he can immediately start summoning. But he needs to have magical energy. Its represented by cards lying on a magic pile. And because this place is empty in the first round, he is unable to cast any spell. He will have to do with units he already has from starting placement. 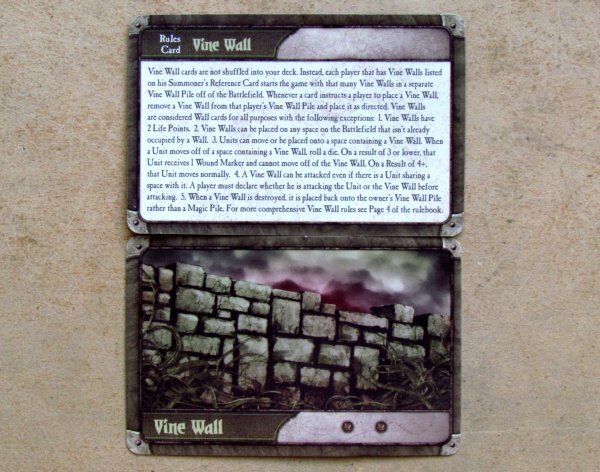 Later in the game, he simply pays number of cards from magic pile for intended summoned creature and places it on the game board adjacent to wall under his control. During third phase of his turn, player can use any of event cards he is holding. In addition, generals can also let their workers build a wall anywhere on the board. First one is already built by starting placement. With those few units, which they have since the beginning on the board, can players then move. Its possible to move up to three units to a maximum distance of two during one turn. Opponent’s units can not be jumped over and sometimes the movement is bound to special abilities. After movement, units can finally attack. A player can hit any entity, that is present on the battlefield, but unit can only attack enemies in same row or column as its card. 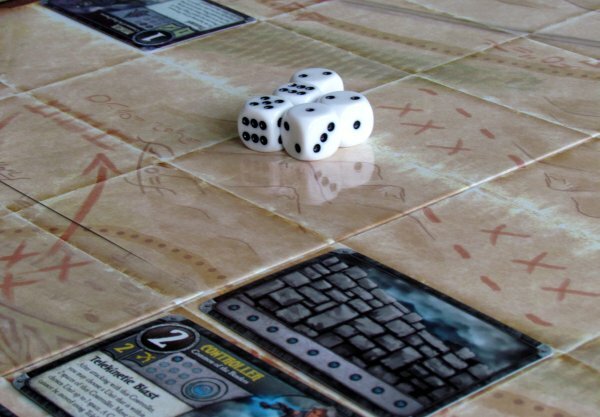 Game distinguishes between melee and ranged attack (up to a distance of three fields), but it always means, that players must take dice into their hand. Strength of the unit corresponds to number of dice rolled and each result of three or more is automatically considered hit. Injured card gets the appropriate number of wound tokens and if their value exceeds number of lives unit has, then attacker acquires it and puts it on his magic pile. This is first way, how to get more magic power for development of your army during next rounds. 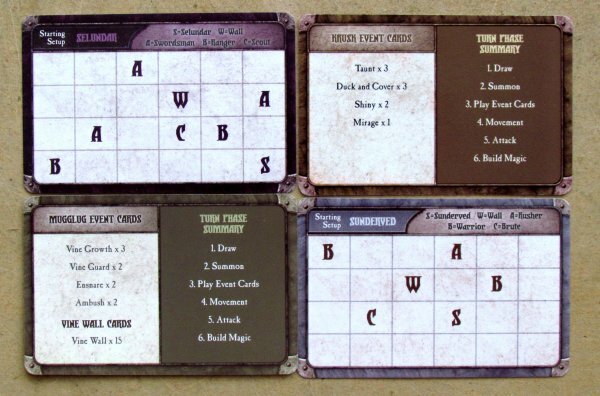 Second option is phase, that ends each round and where players will be building magic. They can take any number of cards from hand and discard them on magic pile. This frees their hand for new cards, but makes also draw pile exhaustion come nearer. Game ends, when you destroy an opponent’s main character. 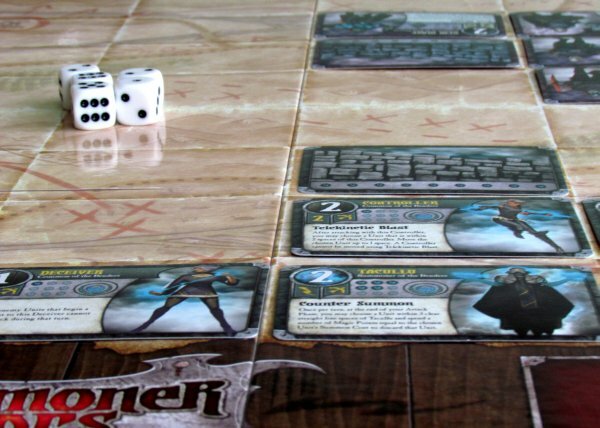 Summoner Wars is a very addictive card game, that actually, in essence, represents an advanced game of chess (with dice). This relates to position Summoner as king on the board. 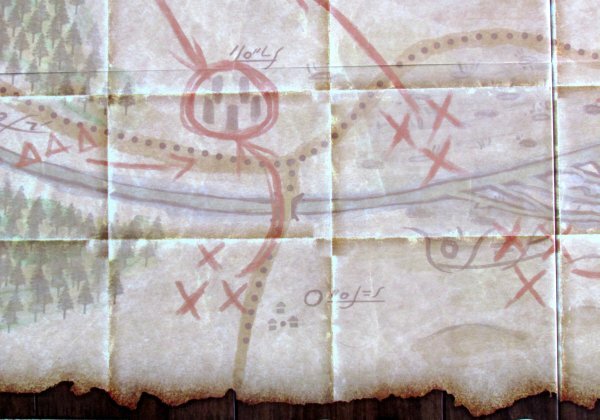 Only this time, not all units start game on the map, but players will gradually summon them, placing them strategically and affectin many other elements, that make a truly unique experience. Its quite a time since its original publishing date, but even now its not late to share our impression with you now. Game puts a lot of emphasis on strategy, proper placement and movement of units, but even on positional play. But then dice enters the game and it creates chaos and entirely different experience. A better one! Every battle, every scuffle is not simply about counting and comparing cards, but the atmosphere is dense and players cannot be sure about anything. Dice usage is such tactical game might appear a bit unconventional, but they work perfectly. Yet, you can easily find players, who will be disappointed by their presence. An important element for the whole match is magic pile. Without it, there are no new units to come. 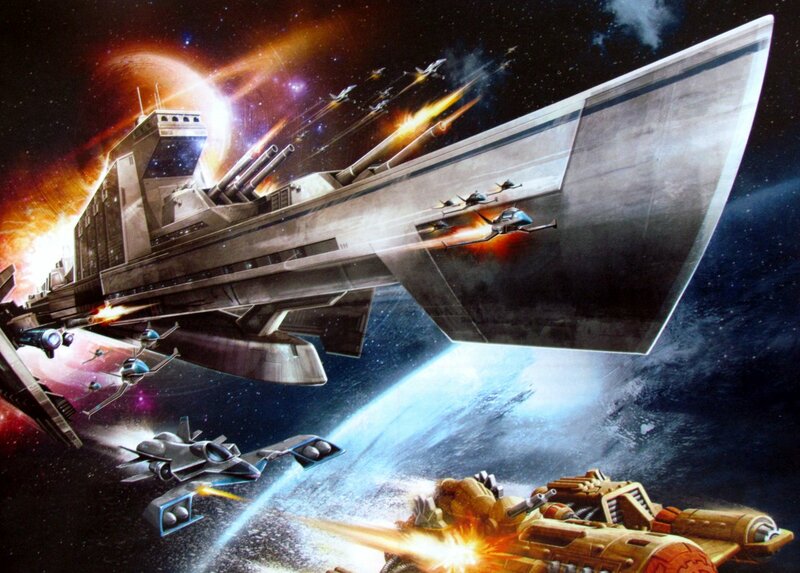 It is excellent news, that it also recharges with destruction of enemy unit. This forces players to constantly push opponent and try to destroy his army. At the same time, it is possible to optimize cards in your hand and prepare well for the next turn. Even if the player gets some unwanted cards, they can get rid of them by putting them aside on magic pile and thus still have a good position for next round. On the other hand, it is good, that events are played for free. Players can play any number of them anytime, they simply need to have them in hand. This can easily be used to surprise your opponent. Options like this bring uncertainty into the game and during later games with the same deck (you know, what cards opponent has in store) an effort to anticipate enemy actions. 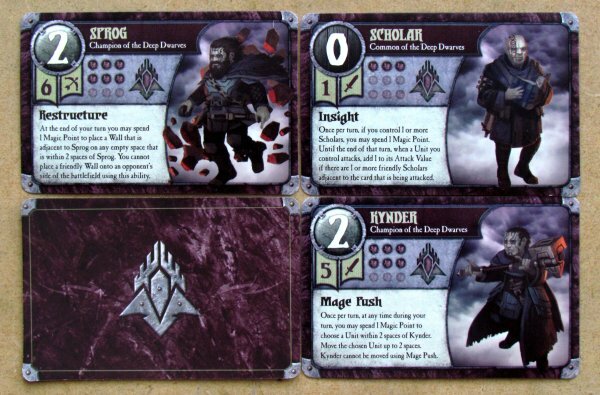 Each faction has a unique cards and starts in their own disposition. This also contributes to really quick preparation of game, that it is always clear and fixed by initial conditions. However, chance to draw the same cards ensures, that each match remains unique and its a game, you won’t get tired even after ten or twenty fights with the same factions. When all this variability is present, we still (more surprisingly) do not need to worry about balance. Individual turns are very fast. Its because of simplicity of all the rules, including movement or line of sight, when shooting at a distance. 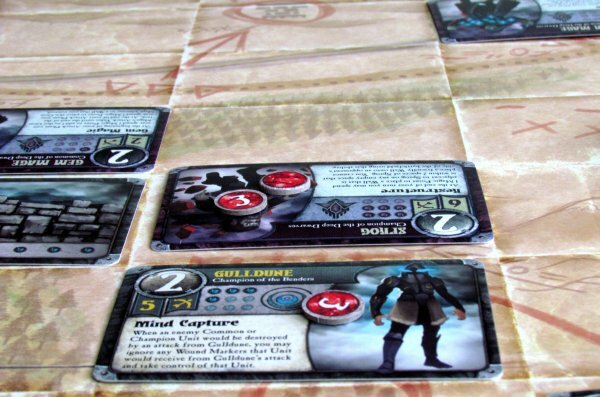 Duel takes usually around half an hour, which is great advantage for this game in comparison with similar games presenting duel to the death (for example Mage Wars – review). But game can stretch with beginners, because they do not know cards so well. Game can be extended up to four players match with two main boxes of master set. But we were unfortunately not able to test this option. 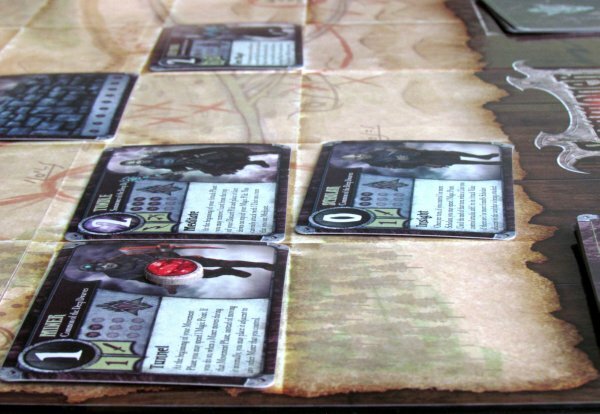 Great advantage of Summoner Wars’s is its gameplay straight from the box. Although there are many expansions and new factions, you do not need them in the beginning. You can enjoy game exactly as you receive it, and even with smaller package, than big Master Set. However, thanks to existence of a large number of expansions and the ability to create and combine your own deck is another level of experience, you can have in this game. Simple rules will ensure, that game can even be considered as a family one and even can be played with children. Cards are arranged well and they are not wearing excessive amount of information. 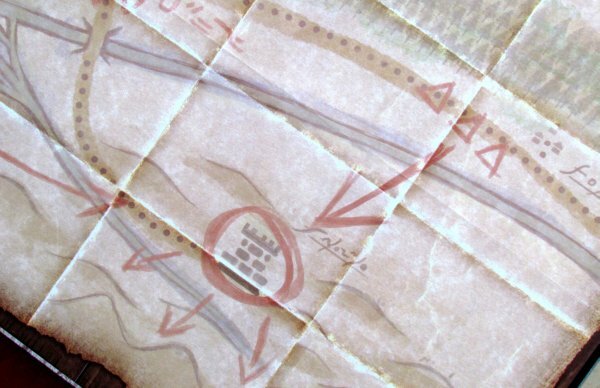 The most important offensive value is large enough and can be seen from a distance, while lives are printed simply as dots, which are covered. Game board is very unusual with its glossy finish, but its not essential for the game. In ordinary starter packs, you will find only folded paper, which is enough. 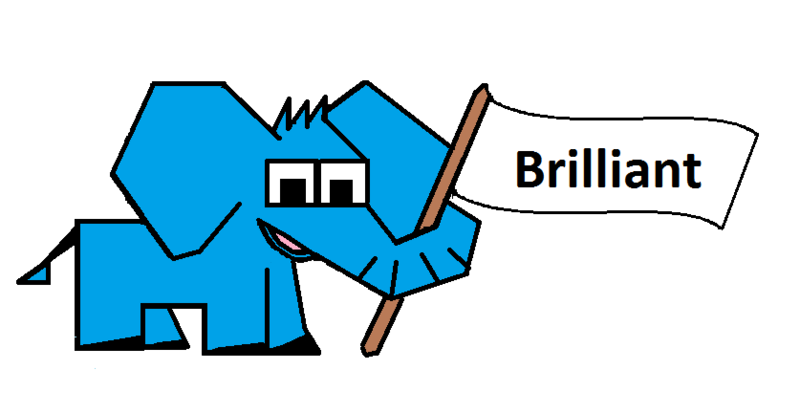 Illustration are not excellent, but will not disappoint you either. 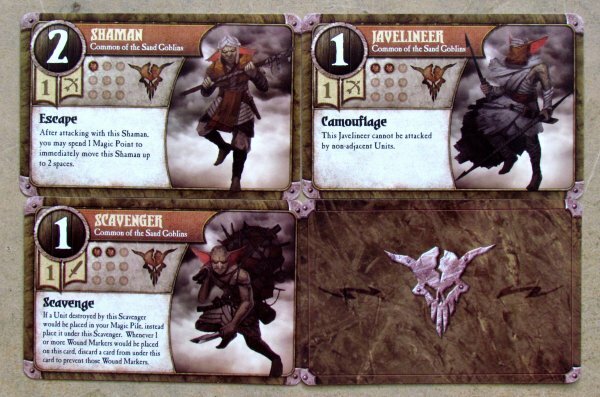 Summoner Wars: Master Set are finally really such a fantasy chess, just as we have compared them at the beginning. However, rules are quite simple, but you will really sweat from the efforts to get the most out of limited movement and unit skills. This is an excellent game for two players and everyone should at least try it. Sure, you can find a number of players, that will be discouraged by dice usage in combination with otherwise very tactical gameplay. 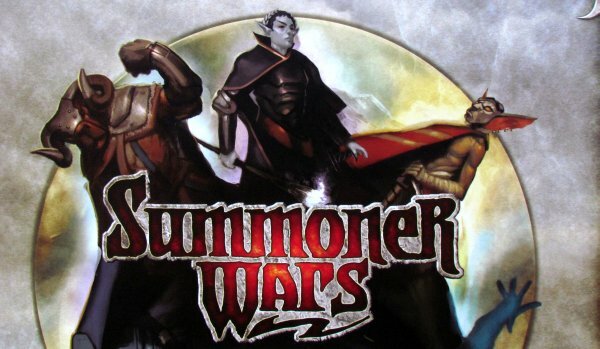 But that does not change the fact, that you will really enjoy Summoner Wars. 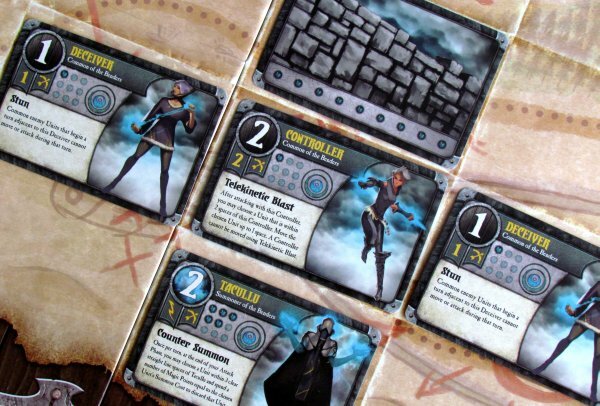 Summoner Wars: Master Set is an excellent tactical game, that goes beyond the depth of chess and also offers a popular fantasy theme. 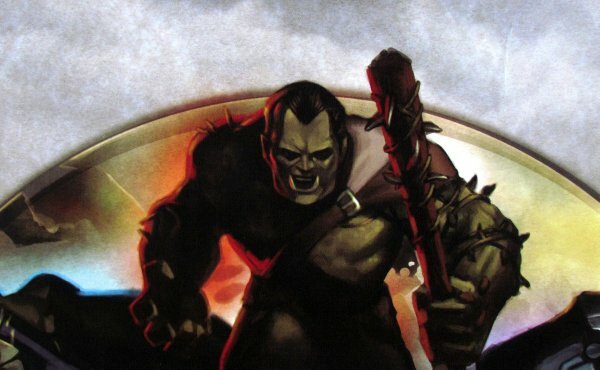 Players each have their race with all the unique skills and capabilities, which leads to a really large variability. Game revolves around efforts to destroy opponent's summoner, but in the meantime, players can and will summon new monsters of their own. For this, you need to aggressively build your deck magic, but also build walls to allow better deployment of units. 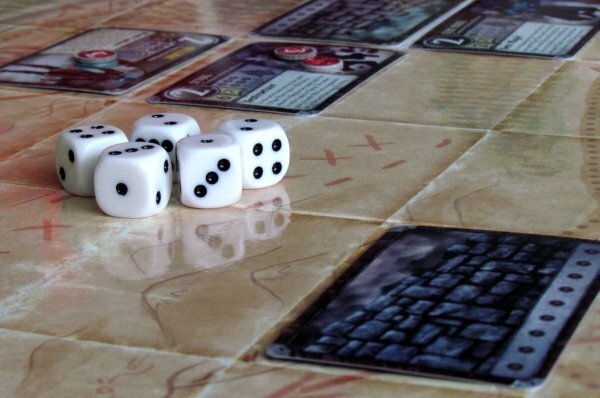 Battles are decided by luck in the form of dice, which gives the whole game an excellent atmosphere. Duels excel with quick preparation and game time, especially if competition is made of two experienced rivals. 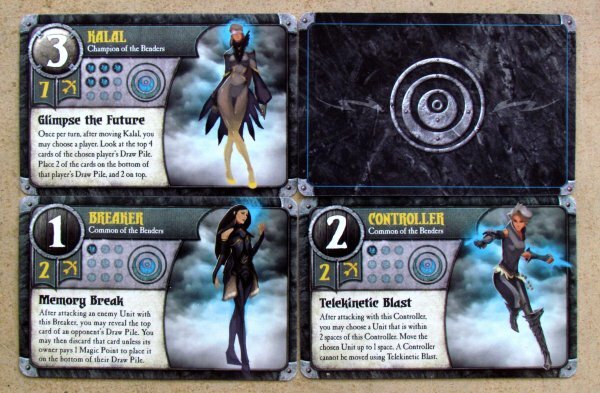 Game does not have some exceptional graphic design, but the cards are good and game board is solid. 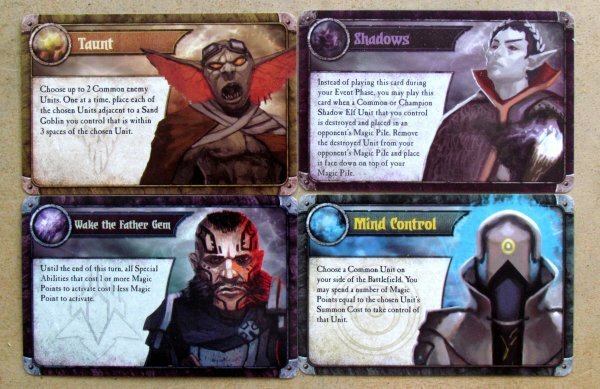 Summoner Wars: Master Set is a great game, that definitely deserves a little bit of hype.